Annapurna circuit trek 10 days itinerary and package information ! Annapurna circuit trek (10 days) is top first most popular trek destination of Nepal, rich in diverse culture and flora and faunas offers a great Himalayan scenery of Mt. Dhaulagiri (8167m), Mt. Annapurna Ist (8091m) Mt. Manaslu (8163 m), Mt. Annapurna II (7937 m.), Mt. Annapurna III (7555m), Mt. Annapurna IV (7525m), Mt. Annapurna south (7219m), Mt. Nilgiri (7041m), Mt. Fishtail also called Mt. Machhapuchhare (6998m), Mt. Hiunchuli (6441m), Mt. Lamjung Himal (6986m),Tukuche peak (6920m), Tilicho peak (7134m). While you are on annapurna circuit trek 10 days, you can see the settlements of diverse communities such as Brahmin, Chhetri, Tibetian sherpa, Thakali, Magars, Tamang, Gurung. Not only this but also you can see some wild animals such as Mountain Thar/ Goat, Leopards, Jackal, birds such as pheasant, long-tail birds among others. Two mighty river valley called Marsyangdi in the east and the Kaligandaki in the west is another attraction of this trek. Kaligandaki is the world’s deepest gorge, flanked by the giant Dhaulagiri and Annapurna Himalaya range. annapurna circuit trek 10 days a part of Great Himalayan Trail (GHT) trekking in Nepal. Thorong la is recognized as a widest pass located at an altitude of 5416m / 17,710 ft above sea level. Due to the difficulties of crossing the pass, the circuit is usually walked in a counter clockwise direction. Traveling clockwise the longer ascent and shorter descent from west to east is too much for many peoples to manage in one day. annapurna circuit trek 10 days can be done any time through out the year. Classic trekking on ancient trade routes using NATT Trail just to avoid roads – Ascending the Marshyangdi valley – Passing Manaslu and Hinchuli – Visit old Buddhist monastery in Braga – Explore beautiful Manag village – Crossing the Thorong – La (Widest pass in the world about 5416 m) – The Pilgrimage town of Muktinath, View of Dhaulagiri Ice fall, – The world deepest gorge and the Kaligandaki valley – Natural Hot spring at Tatopani – Sunrise at Poonhill with magnificent mountain views. Annapurna circuit trekking is appropriate for any trekkers who is looking for little bit adventure. The maximum height of Annapurna circuit 5416 m on Annapurna circuit. It is not necessary any previous trekking or mountaineering experience and also it is not necessary that you must be young and energetic to do this trekking. If you are healthy and can walk 5 to 6 hours daily, you can easily do this trekking. However it would be more good to do daily jugging or walking exercise is useful before you leave from your country. Our program have been prepared including rest day and build up gradually, in order to acclimatize to the altitude. On trek, you can go at your own pace, with plenty of stops for resting. Kathmandu – Besishar – Manang – Throung La pass – Muktinath – Tatopani( natural hotspring) – Ghorepani Poonhill – Ghaundrung village – Pokhara. February, March, April, May, June, September, October , November and early December. Day 08: Acclimatization day ! Day to discover around ! Day 12: Fly out from Jomsom to Pokhara city. Our trek to annapurna circuit trek 10 days or express Annapurna circuit Trek is a classical with 12 days itinerary compared to most walks in this region. The particular route is designed for globe trotters who wish to hike in Annapurna circuit with relax manner itinerary however if you are planning with limited time wise than take a look this special itinerary on annapurna circuit trek – 10 Days which would be a more appropriate choice. Day 02: Drive to Besisahar by bus (760m/2,485 ft), 9 hours. Early morning, the guide will come to take you at your hotel at 6 o’clock in the morning to pick you up. We have 7 hours of driving to Besishar (185km) far from Kathmandu. On arrival at Besisahar, you will have a great view of snowy mountain scenery. As upon your arrival in Besisahar, we take another bus or jeep (collection basis) for the further drive to syange. Syange is a nice place where you can relax with the view of the great waterfall. Overnight at Guest house. Day 03: Trek to Bagarchhap (2,160m/7,063 ft), 6 hours. The day begins with the rocky mountain trails following the Marsyandi Rivers steadily uphill to Tal at 1675m, the first village in the Manang district. We make a trail verse crossing a wide, flat valley. The journey continues up and down to Dharapani at 1890m. A stone entrance chorten typical of the Tibetan influenced villages. Bagarchhap at 2160 m offers typical flat-roofed stone houses of local Tibetans design along with the local village surrounded by maize terrace and Apple Orchards. Overnight at Guest house. Day 04:Trek to Chame (2,630m /8,600 ft), 5 hours. The trail climbs to Tyanja at 2360m, then continuing through the forest, but near the river, to Kopar at 2590m. As we reach the Chame, the headquarters of the Manang district, we are rewarded by the fine views of Annapurna II as you approach Chame & two small hot springs by the town. Along with this route we are introduced to a local community said to have migrated from Tibet a long time past, noticeable by their different features. With them, they have bought local Tibetan house designs and maintained their ways. Overnight at Guest house. Day 05:Trek to Pisang village (3,300m/10,791 ft), 5 hours. The day starts through deep forest in a steep and narrow valley, crosses a river on a long bridge at 2910m. Then we cross another bridge at 3040m, from where the view of the soaring Paungda Danda rock face really begins to appear. From there the trail joins to climb to Pisang, which sprawls between 3200m & 3300 m. in the late afternoon, visit upper Pisang for Manangis and their lifestyles and as well as the amazing Himalayan view. Overnight at Guesthouse. Day 06: Trek to Braga village (3,475m/11,363 ft), 8 hours. The trail leads you through the drier upper part of the Manang district, cut off from the full effect of the monsoon. Leaving Pisang, we have alternate trails north and south of the Marsyandi River which meets up again at Mungji. The southern route by Humde, with its airstrip, at 3325m which involves less climbing than the northern route via Ghyaru, though there are better views on the trail that follows the northern bank of the river. From Mungji the trail continues past the picturesque but partially hidden village of Braga where we stay overnight. Day 07: Trek to Manang Village (3535m/11,559 ft), 40 minutes. As you just hiked to Manang village, you can stay there for exploring around. This helps you somehow to acclimatize your body. We recommend you to spend doing some fine walks to the Gangapurna viewpoint and glacier for the better view. Stay overnight at Guest house. 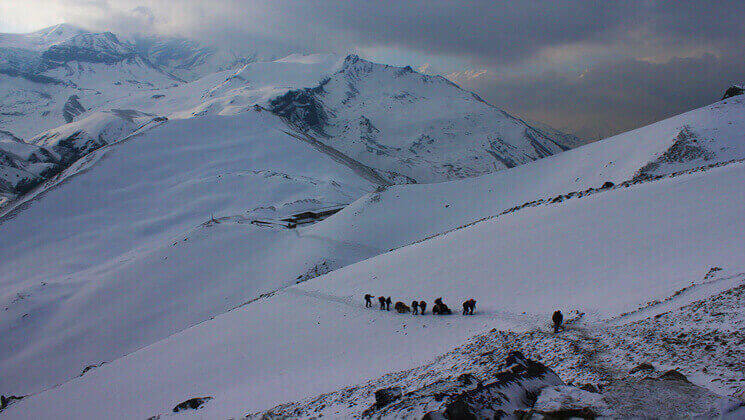 Day 08:Trek to Yak Kharka (4,050m/13,244 ft), 4 hours. Trek leads through cultivated land of Tanki Manang. We make the climb steadily through Tenki Manang, leaving the Marsyandi Valley. The trail makes an ascent of nearly 500m to the Yak Kharka. Continuing along the Jarsang valley, you can see some Yaks grazing. Finally, we reach at Yak Kharka where we stay overnight at Guest house. Day 09:Trek to Thorong Phedi (4,450m/14,552 ft), 3 hrs. After ascending for two hours the trail descends to cross the river at 4310m, then we climb up to Thorong Phedi at 4450m. There are good guest houses and offers very good foods, Bakery, as well as Internet and telephones, are also available here. Overnight at Guesthouse. Day 10:Trek to Muktinath (3,800m/12,426 ft) via Thorung La pass (5416m/17,710 ft), 8 hours. Today is challenge day rather than others. We begin our trip from very early in the morning. At sunrise, as we need to set out early to complete the crossing of the Thorong La at 5416 m. The trail is steep right from the start, but with a slow and steady pace, we should reach the summit within three hours. Prayer flags and hot tea await us as we reach the highest point of our trekking. Our descent to Muktinath is long, but the views of border Himalayas and Dhaulagiri family are simply amazing. Muktinath is a large settlement with several lodges to choose from. Hot showers and a good meal will allow for a quick recovery after today’s long and difficult excursion. Overnight at Guesthouse. For the first part, you need to walk downhill to get Ekle Bhatti than the trail goes through Kali Gandaki river bank up to Jomsom Bazaar. Stay overnight in Guesthouse. Day 12: Fly back to Pokhara, 25 minutes. After early breakfast in the morning we check in the airport at Jomsom and fly about 25 minutes to reach Pokhara. When you land in Pokhara our guide will transfer you to Hotel at Lakeside. Rest of the day enjoy by walking around the lake, shopping or boating in the lake. Or you can do half day sightseeing such as visiting Devi’s fall, Gupteswor cave, Tibetan refugee camp, Tal Barahi temple / Seti George… etc. Overnight in the hotel. Drop you in Kathmandu International Airport onward your final destination and our trip ends. Wish you your wonderful journey !! How much does the annapurna circuit trek 10 days cost? Express Annapurna circuit trek cost we offer you Tourist Standard accommodation at our homestay located nearby Thamel, Kathmandu and tourist standard accommodation in Pokhara Fewa lakeside and of course the trip price will vary according to group size. Taking flights to and from Pokhara saves your time and riding bus reduces the trip expenses. For the deluxe and luxury trekking tour plan, we add Kathmandu – Pokhara – Kathmandu round trip airfare, 3 star category hotel deluxe air-conditioned room in Kathmandu (BB PLAN) and 2 star hotel standard accommodation in Pokhara (BB plan) with attached bathroom while on trekking on possible places, so let us know. AND WE ARE OPEN TO CUSTOMIZE YOUR TOUR AND PACKAGES PRICE AS PER YOUR REQUIREMENTS. International tour leaders are highly encouraged to get discount and attractive complimentary. Domestic flights: Jomsom to Pokhara with airfare and airport departure tax. Bus transfer from Kathmandu to Besisahar & Besisahar to Synge by local bus / jeep. Pokhara to Kathmandu transfer by Tourist Bus. (By flight cost an extra USD 95 PP). Answer: Yes sure !! If you provide us with your flight’s details then you should do request then our representative will come to pick up you at Kathmandu international airport. Question: Do I need the experience to do annapurna circuit trek 10 days? Answer: Actually for Annapurna circuit trek is suitable for keen trekkers/walkers who are able to walk around 4 or 5 hours in a day, with a light weight day pack. For this trekking, if you have about the little experience would be better. Question: What kind of accommodation can I expect on annapurna circuit trek 10 days? Answer: We provide you tourist standard accommodation in Kathmandu and during the trekking routes. the rooms along the routes are clean with the cozy bed with a nice mattress and blankets. However we recommend you to take your own sleeping bags if you have one with you otherwise, you may rent it while you are in Kathmandu. Question: What opportunities will I have for a shower along annapurna circuit trek 10 days? Answer: Guest house trekking all the lodges they have a shower which you can get it somewhere paying and somewhere without paying however if you are in camping trekking – we provide you hot water bucket then you will take a bucket shower. Question: How do I get drinking water on AC Trekking fly out from Jomsom to Pokhara? Question: Is there any communication facilities on annapurna circuit trek 10 days fly out from Jomsom? And regarding the deposit, we prefer 20 % advance deposit of the total price of the trip in order to confirm your reservation before you arrive in Nepal. And rest of the payment can be made after your arrival in Nepal. Question: Who will carry my luggage on annapurna circuit trek 10 days? Answer: We provide porters to transfer your luggage. As we are a responsible trekking tour operator agency, each of our porters carries a maximum 25 kilo of your backpack which means 2 guests (12.5 kg luggage of each guest): 1 porter basis. Answer: When walking in the mountains, the distance you cover each day can vary greatly due to the gradient, terrain, and altitude. As such it is very hard to give specific distances on each day, however, you have to be prepared to walk roughly about 5 hours each day. Answer: Yes! Of course. Annapurna circuit trekking is also known as around Annapurna trekking. AC trek is a shortcut of Annapurna circuit trekking. Natt trail is also same. The above itineraries are subject to change due to condition beyond our control. This is a Guide line showing tentative camp night stops. Physical, technical and natural condition may change this above itineraries.